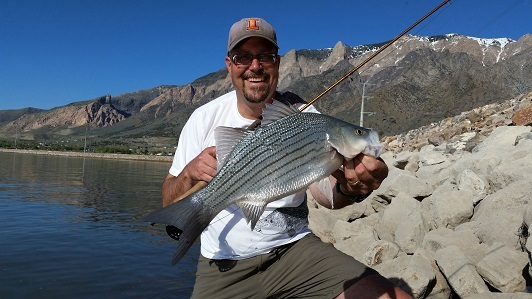 Salt Lake City - Wipers-a hard-fighting cross between a female striped bass and a male white bass-are fast becoming a favorite fish to catch in Utah. If you'd like to get in on the action-but you're not sure what tackle to use or where and when to catch the fish-you won't want to miss a free seminar on April 26. If you can't attend the event, you can watch it live at https://youtu.be/9gyMiEnMrIQ. You can also visit https://youtu.be/9gyMiEnMrIQ anytime after the event and watch the seminar whenever you like. The event is free, but you must register to attend. You can register at http://bit.ly/wiper_seminar. The Division of Wildlife Resources, Smith & Edwards and Utah's Blue Ribbon Fisheries Advisory Council have teamed up to offer the free event. Wiper fishing experts will cover tackle and equipment, trolling tactics and various methods to catch fish from the shore. The seminar will focus on fishing opportunities at Willard Bay and East Canyon reservoirs and the DWR's approach to managing wipers at both waters. "Many anglers, including myself, have really enjoyed the chance to catch this hard fighting and great tasting fish," he says. "From the first time I caught a wiper, I knew I'd found a new favorite fish to catch and cook for my friends and family." The April 26 seminar is part of the DWR's new Wildlife Recreation program. "These seminars are just perfect for helping people expand their fishing knowledge and explore new fishing opportunities," Douglass says. You can learn where and when the events are being held at www.facebook.com/UtahDWR. The events are also included in a calendar at the agency's website (www.wildlife.utah.gov/calendar.html).